I discovered the Australian writer Liane Moriarty when I downloaded a copy of "The Husband's Secret" as an audio book from the local library. 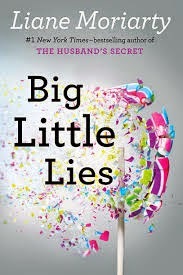 It was very interesting, so I was excited to read her new book Big Little Lies. I wasn't disappointed! This book is a real page-turner that kept me up way past my bedtime trying to find out what would happen next! The story centers around 3 women. Madeline is the mother of 3 children. Her teenage daughter was from an earlier marriage, and she has two younger children with her current husband. Her first husband left her when their daughter was just a baby, and now that he has remarried and has another child, he wants back in to the older daughter's life -- much to Madeline's disgust. The second main character is Celeste. She's impossibly beautiful and married to an absurdly wealthy man. Unfortunately, he also lashes out violently toward her on a regular basis. She's never told anyone about her situation, both because she's ashamed and because she sometimes fights back and feels that she's also to blame. She and her husband are the parents of twin boys. The final female lead is Jane, a single mother to young Ziggy. Jane works from home as a bookkeeper, and moves around a lot. She had a traumatic experience with Ziggy's father, and has spent the years since he was born restlessly moving from one place to the next, never settling down. All of these characters come together when their children start kindergarten together. The mothers at the kindergarten turn out to be cliquish, gossipy and vindictive. Things start out on a bad foot when on the first day, one little girl is assaulted by a classmate. Her mother demands to know who hurt her, and the little girl points out Ziggy as the culprit. He denies it, but this taint on his character has terrible consequences. A petition is started by the other parents to get him expelled from the school, and most of the other mothers shun Jane. At the start of each chapter are hints that something terrible happens to someone. Other parents are discussing the aftermath of some tragic event, and even police officers are quoted as saying they think people are hiding something. A school trivia night, where all the mothers dress up as Audrey Hepburn and all the fathers dress up as Elvis, is looming, and that seems to be where the horrible thing happens . . . whatever it is! As I was reading I was trying to guess which of the characters was going to meet a bad end, and who would be responsible for it. Most of the characters seem to have something to hide, so there were numerous possibilities. I enjoyed the book overall, but I did feel that the resolution to the whole bullying scenario was a bit rushed. Otherwise, it was a great read!